The H-man, Prof. Howard Rambsy, asked me to write about who I am as a student, basketball player, writer, editor, researcher after twenty posts to The Basketball Project. After 10 weeks of basketball, why did I come back to a line from a 1980’s teen drama, released three years before I was even born, that relates in no way to the game which we’ve so passionately documented? I have no idea. What I do know is that The Basketball Project has been eye-opening to me socially, as a diagnostic device of prejudice, institutionalized racism, and the blurry lines that divide OK and not OK in the world of sports and race relations. Perhaps the project has left me cynical in this respect. One of the toughest conversations I worked through was a question posed by Rambsy about what it means to highlight the courtesy and relative niceness of Kevin Durant. I’ve never been fond of the fact that commentators, most often at the college level, have to cite why a particular white player is good at basketball, drawing on schoolyard legends to prove the Caucasian athlete “has the chops” to be on the floor with black – which implies “superior athletically” – players. That question is about the character of athlete. Flip the question to Kevin Durant and you have commentary on the supposed emotional state and character of an entire race, summed up in the dynamic that Kevin Durant is one of the “rare nice ones,” as if he’s the only African American to smile and kiss his mother. It’s sickening, disheartening, disturbing, irksome, unsettling; an egregious message behind seemingly complimentary words. To say that I’ve changed as a student does not contain the theories and dilemmas I’ve been forced to encounter: I have changed as a person. I may have to hit mute on my television soon because I listen to every comment, noting tone, implication, and meaning, and I critically analyze how this game – because ultimately that’s all it is – is shaping the dynamics of race in our culture. 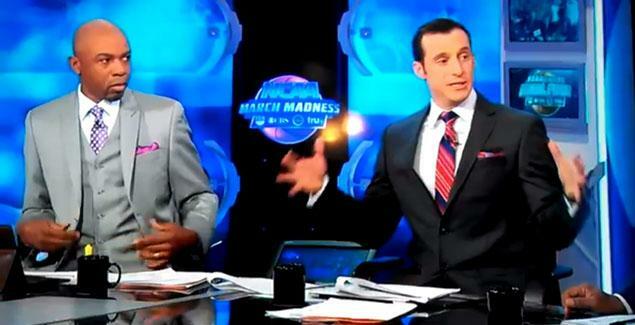 Look at the social media explosion around Doug Gottlieb’s comments this past Thursday. Charles Barkley said it was “no big deal,” but I beg to differ: it’s purposely divisive and insensitive. Through our study, I have come to see the damage such comments cause on the larger scale of American prejudice, backed up in jokes, mass stereotypes, and the media, and that is a lesson I will take with me for the rest of my life.